When equipping your employees or your home business with the necessary supplies, the one thing that people have a hard time purchasing are office chairs. You want a chair that is functional, can withstand constant use, and won't be uncomfortable or cause back pain whether a computer office chair or an executive boardroom chair. 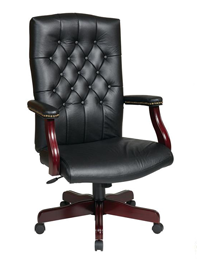 At Discount Office Chairs, you can find the chair you need for all your employees, providing high quality leather office chairs. You can find office chairs, meeting chairs, waiting room chairs and computer chairs based on your personal tastes and the type of office chairs that will match your office decor. Choose from high backed office chairs, armless office chairs, office chairs with or without casters, and most are adjustable office chairs. Place a Zuo Lider Plus Armless chair at the front desk of your receptionist, or purchase the Zuo Pinhole office chairs as computer chairs for your employees. Fill your conference room with the Zuo Performance office chairs. Or place the Zuo Lider Plus chair in your home office for the right amount of comfort. Whichever chair you choose, know that you are getting the highest quality available and that every chair has been tested to ensure that you are receiving a high quality product. Contact us for further information or to furnish your business or home with leather office chairs.